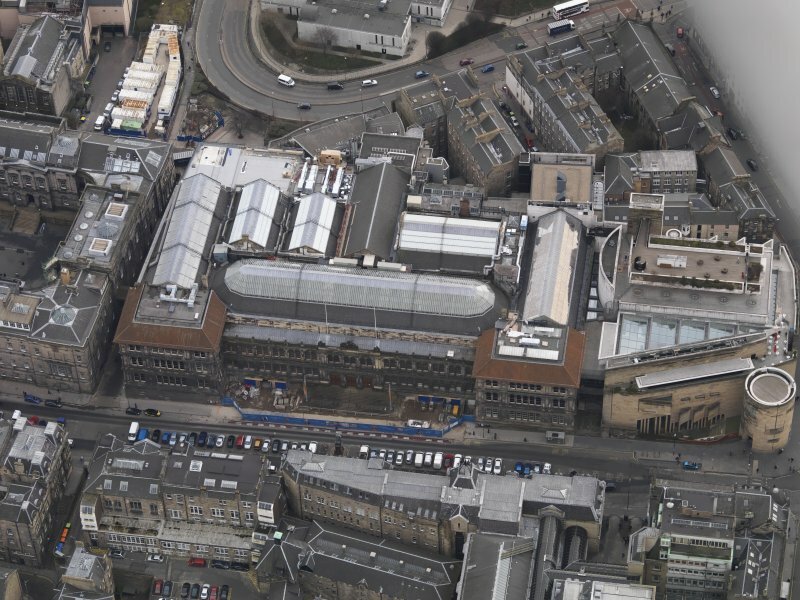 View of Heriot Watt College, Chambers Street, Edinburgh. 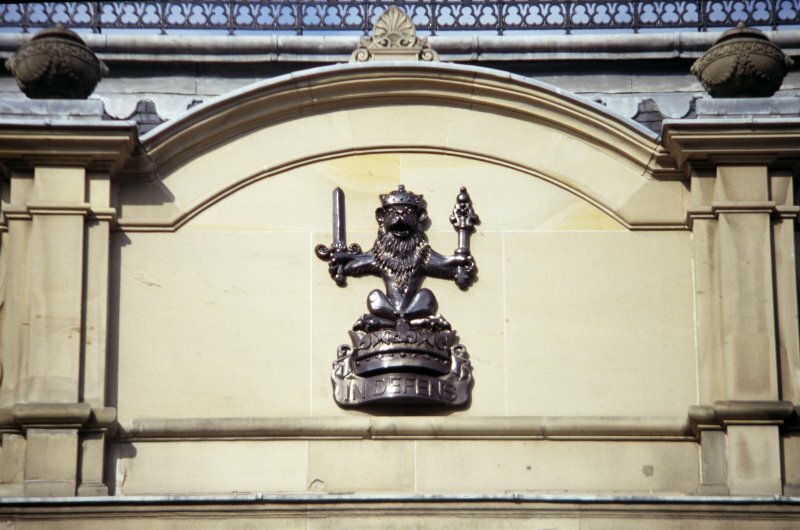 View of heraldic lion, one of two on gables at E and W ends of Crown Office. 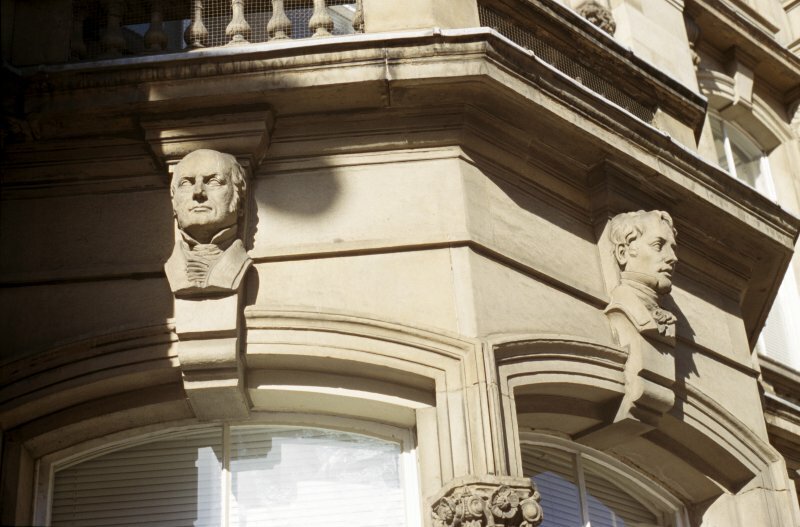 View of keystone heads, above ground floor bay window at E end of Crown Office (originally the Phrenological Museum). 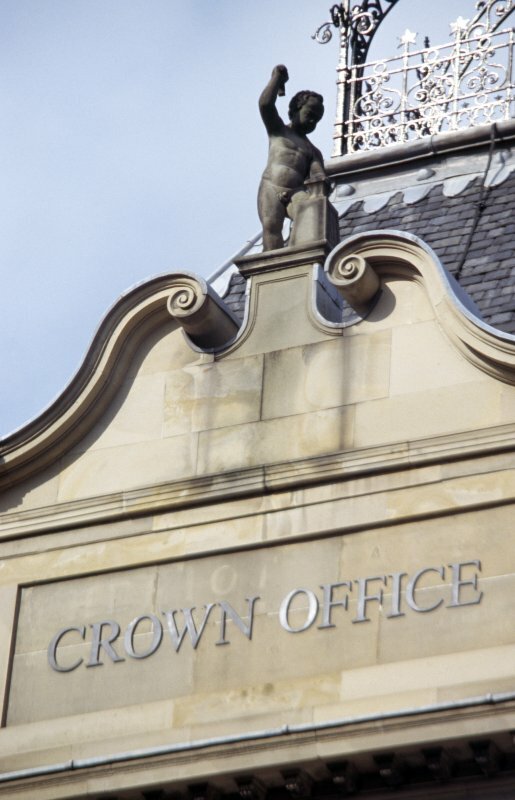 View of putto with hammer and block, at top of central pediment of Crown Office. 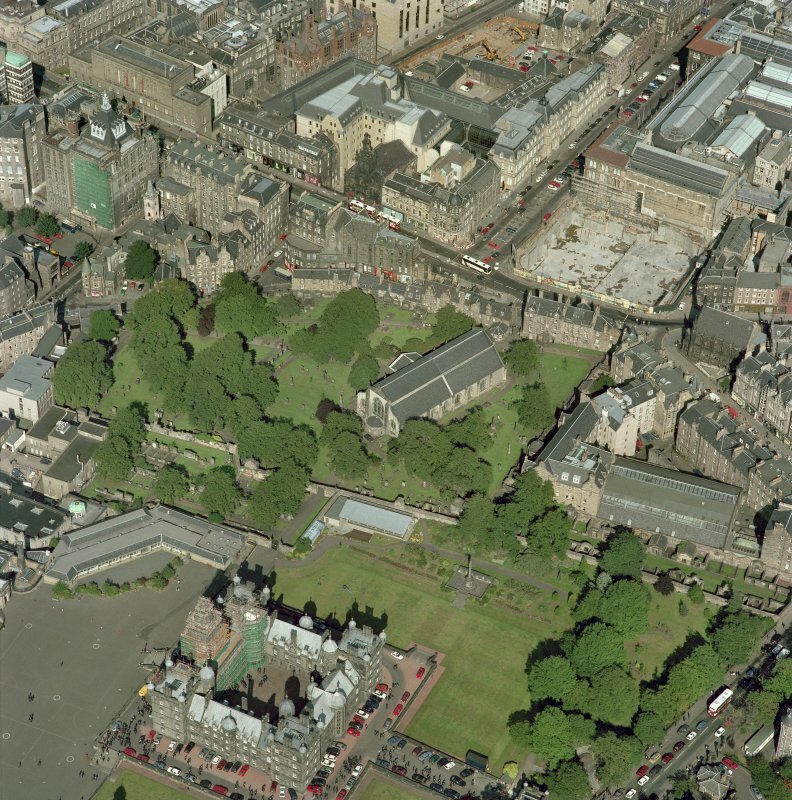 View of Crown Office from SW.
General oblique aerial view of Chambers Street centred on the Royal Museum of Scotland, taken from the NW. 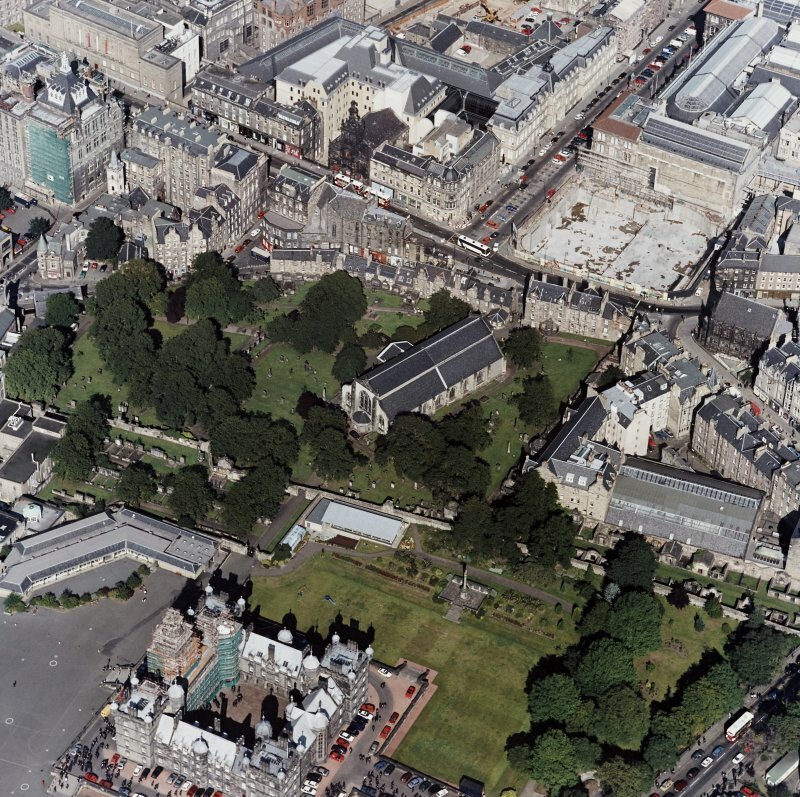 General oblique aerial view of Chambers Street centred on the Royal Museum of Scotland, taken from the N.
Undergoing conversion to Sherriff Court building, 1990. 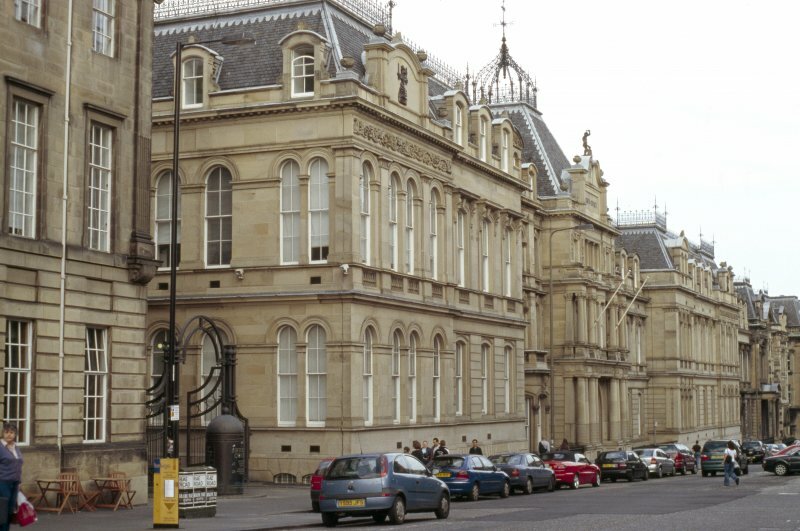 Converted to Crown Office and Sheriff Court House circa 1990. 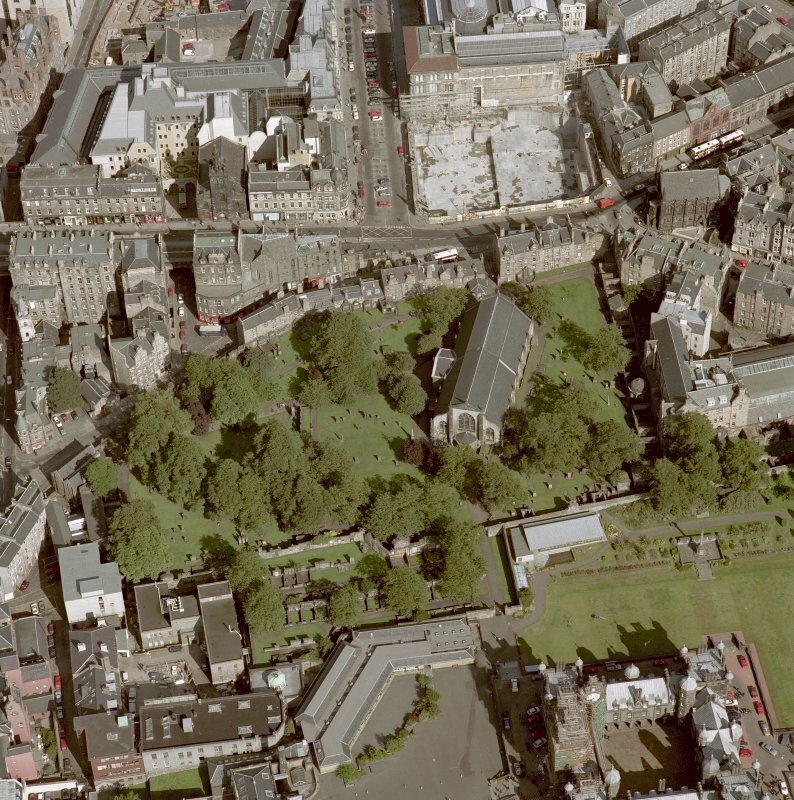 4 pages of text giving details of background to development of site at Chambers Street plus one sheet with site plan by Andrew Rollo, 1948 -FILED UNDER "HERIOT-WATT COLLEGE, CHAMBERS STREET"
[Handwritten note on photocopied catalogue slip to say most of the above have been copied and negatives are available if required]. Four male keystone heads with cravats and high collars, three around a bay window, the fourth above the window to the immediate right of it. From left to right, heads 1 and 4 are middle-aged balding men with sideburns, head 2 is a very young man with wavy hair, and head 3 is somewhat older (though not as old as 1 and 4) with hair receding around widow's peaks. 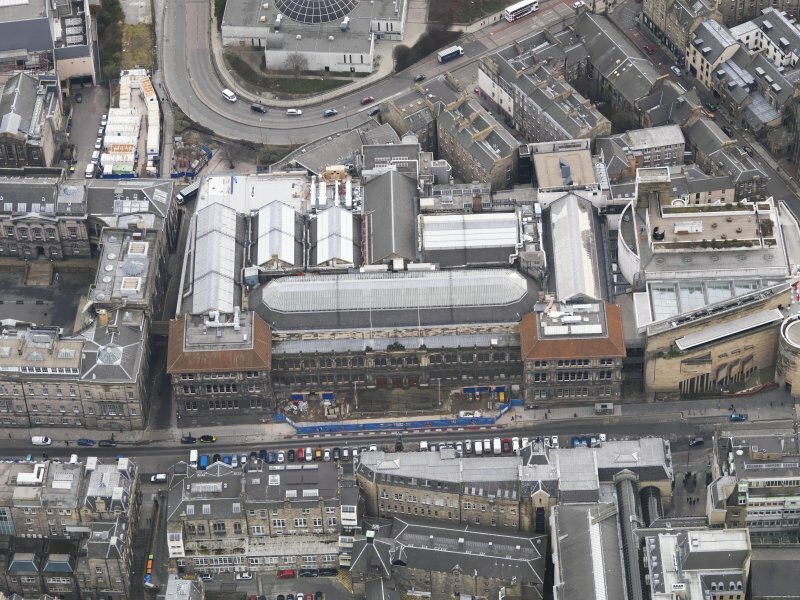 At the top of the building is a naked boy with hammer and block. His right arm is raised above his head, his right hand holding the hammer; his left arm is on the block. He stands with feet and legs apart. Below, between the windows, are four panels carved with foliage and, in the centre of each panel, from west to east: a flower, a star, a flower, a star. Above the paired columns of the ground floor are square panels carved with, from west to east: star, flower / star, flower / star, flower / star, flower. In the middle of the façade above the paired columns is a carved frieze with entwined letters in the centre. The keystone above the entrance is also carved with the same entwined letters. The bottom third of the paired columns is carved with stars and flowers within a criss-crossed lattice. At each end of the building is a low-relief lion, upright and facing front, crowned, with forelegs outstretched. In its left paw it holds a sceptre, in its right a sword. It sits on top of a crown. Below each of the lions, above the first floor windows, is a frieze with a griffin's head and wing at each end and, between, intertwined leaves, flowers and stars. On the capitals of the pilasters between the first floor windows are stars and flowers carved in low relief. On the west end of the building the first (west) capital is bare; on the 2nd and 4th are flower, star, flower; on the 3rd are star, flower, star. On the east end of the building all four capitals are carved: 1st and 3rd star, flower, star; 2nd and 4th flower, star, flower. 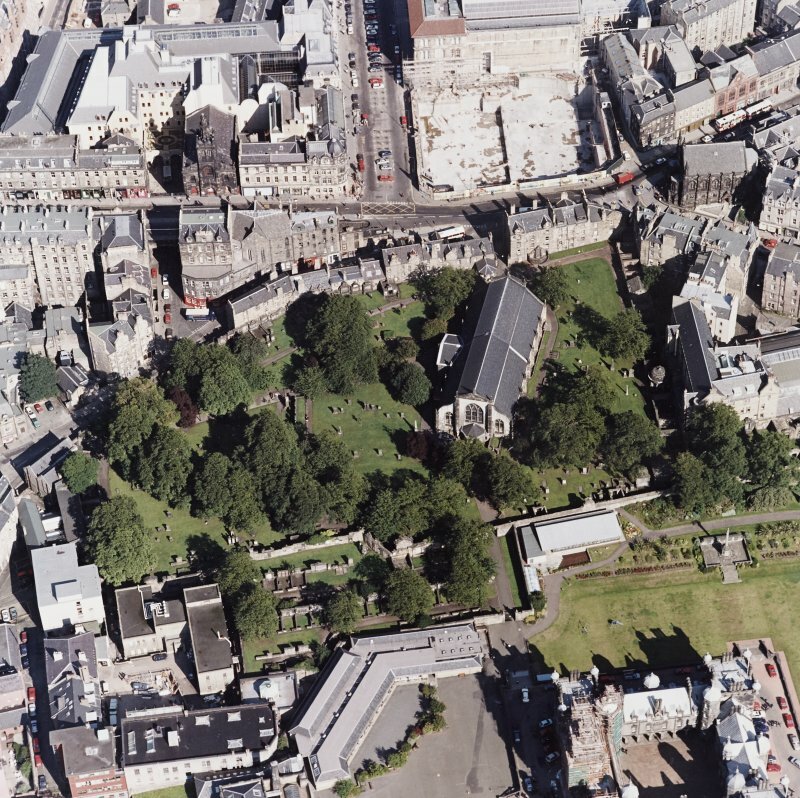 The east and west ends of the building are by John Chesser in 1886-1888. The stone carving will date from this time. 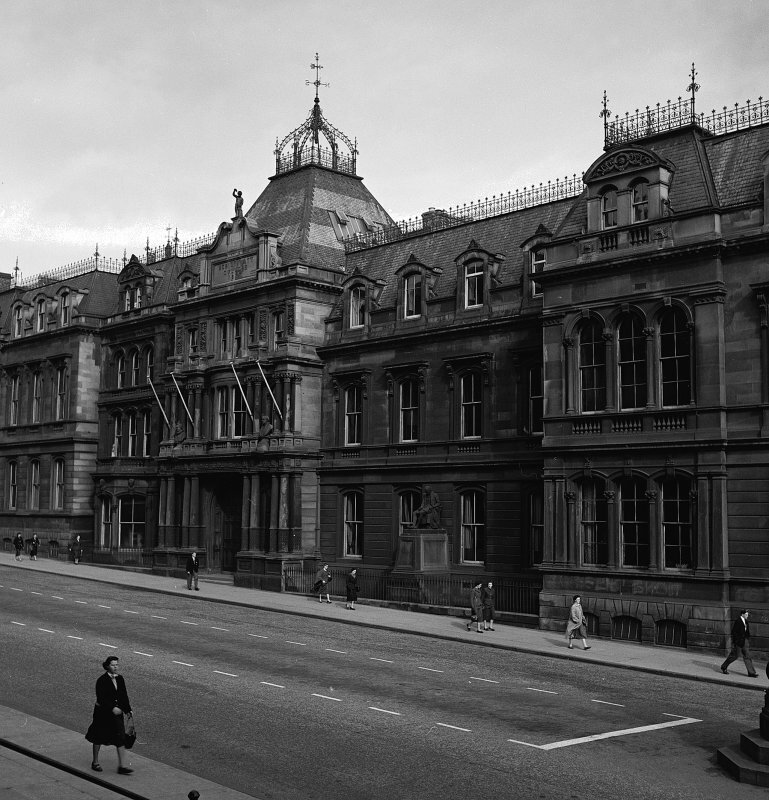 In 1990 the whole building was converted to the Crown Office. The metal lions will have been attached to the façade during this conversion.